It's not my first time here. a different method (1 hour per day) besides my full-time job. 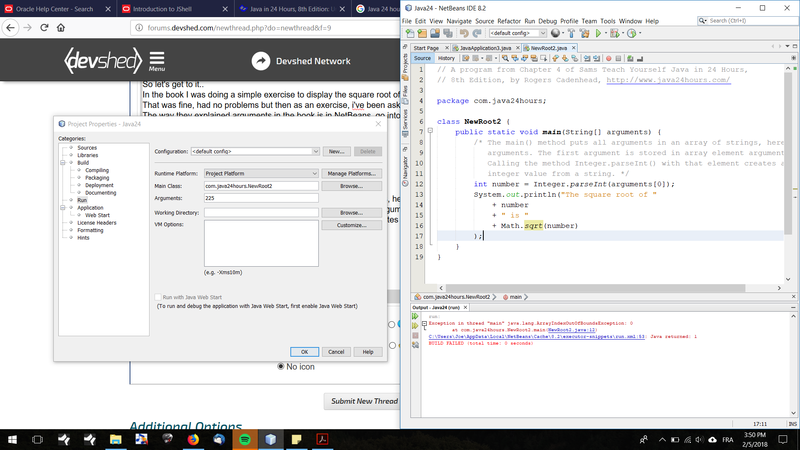 In the book I was doing a simple exercise to display the square root of a number using java. arguments. The first argument is stored in array element arguments. System.out.println("The square root of "
and modify the arguments of the class directly there. discipline myself enough so i ended up not finishing the book. This method is really confusing the h*ll out of me. into the project configuration and have it there. The program should check that the size of the array passed to main is greater than 0 before trying to use any of its contents. The length field: theArrayName.length returns the size of the array. I don't know anything about how to configure the IDE NB. where 123 is the String that will be placed in the array passed to the main method. The argument is the begining of the array starting at index 0. I've encountered a similar problem to this before. It's basicually saying either the current array goes over the array's limit or is starting where the array does not. You could try a I/O Exception catch and see if it comes with a different result.